The market for subscription boxes is getting fierce; boxes packed with more products and with more variety. I’m not one usually for lifestyle items, but I decided to try My Little Box as they have their own beauty brand, and had a tempting first box offer for £10 (including postage). The concept of My Little Box is based on the typical lifestyle of a Parisienne and the monthly box contains a selection of items made up of lifestyle (e.g. notebooks), fashion (e.g. scarves), and at least two full sized beauty items (from their own brand). One important thing to note is that you can unsubscribe any time up until the last day of the month, as billing is on the 1st of each month., which is ideal if you want prefer a flexible subscription. Each box costs £14.95, which includes shipping, or £13.95 if you have the box delivered to your work address. The theme was the ‘Garden’ for this month and included a chart of fruit and vegetables and when they are season, which was a nice touch, even though it may not be that useful, but you never know! The main item, the fruit infusion water bottle was the most intriguing item, and it’s quite ingenious. Of course you can use it as a normal water bottle without any fruit, but there are a few ideas with what to add, namely chopped up mint, lemon, or cucumber. The idea is to encourage a healthy way of drinking by upping your fruit content. The navy blue scarf was sweet, but to be honest I doubt I would ever use it, but as a writer, notebooks always come in handy. 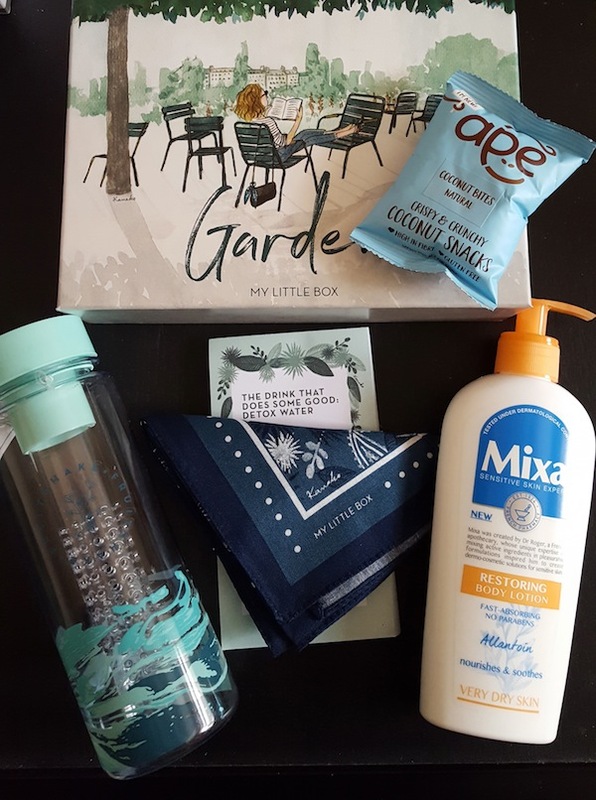 A full sized body lotion is something everyone can use, and can double up as a hand lotion, and inside the drawstring pouch were the beauty items. The Vitamin Shot is a gentle gel scrub with apricot, bamboo, and argan oil, which was refreshing to use. The Easy Morning moisturiser is a light lotion that is suitable for all skin types, and has a fresh and subtle scent to it. 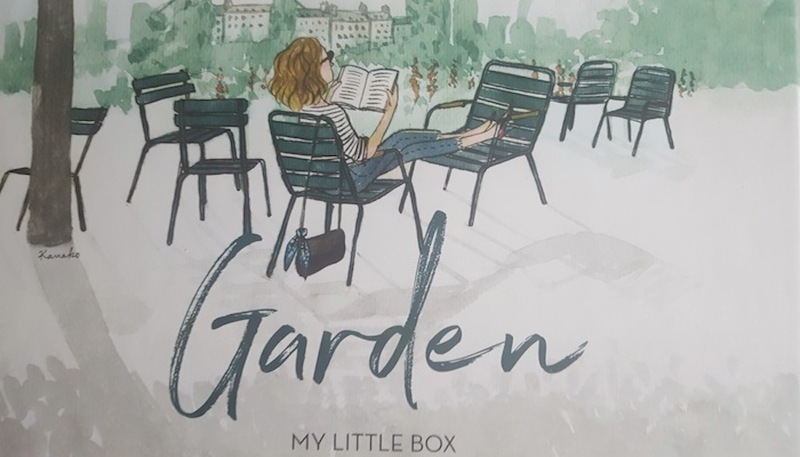 Currently, the My Little Beauty products can only be bought in France and the moisturiser retails at €14, which makes the box excellent value, which already covers the cost of the box. The quality of the beauty products was good, and are packaged stylishly, and the range seems to be expanding. The whole process from ordering to receiving the box was easy and straightforward. Signing up was simple, and the products in the box were all excellent quality and packaged perfectly. This is more of a treat box as it also contains lifestyle and fashion items rather than a beauty box, however, many other beauty boxes seem to be incorporating lifestyle elements into their boxes too, simply because there is a limit to obtaining samples from cosmetics companies. On the whole, the box represents good value for £13.95/£14.95, and the ability to unsubscribe at anytime gives the consumer control. If you like the April box, you can still order it now (as long as there are stocks) until the end of the month. Use the code FIRSTBOX to get your first box for £11 or £10 if you choose to have it delivered to your office.